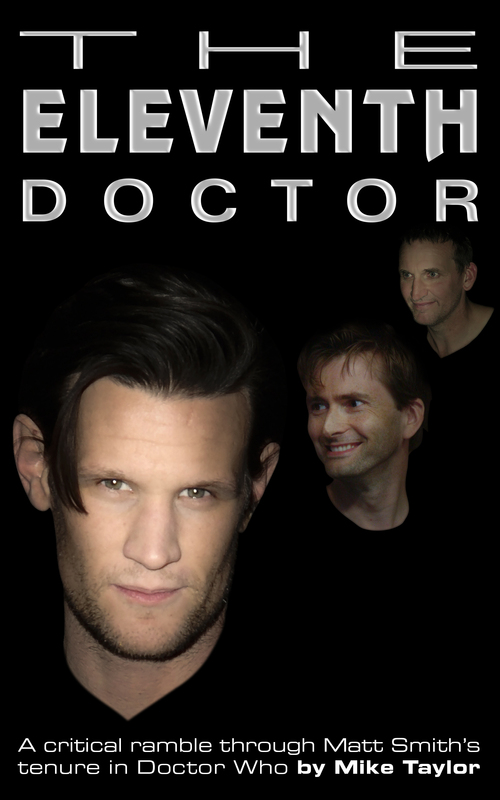 My book, The Eleventh Doctor: a critical ramble through Matt Smith’s tenure in Doctor Who, is now available! Kindle e-book on Amazon: USA, UK, Canada, Australia, France, Germany, Italy, Spain, Mexico, India, Brazil, Japan. Other e-book formats may follow if there is demand. If you want a sense of how much book you get for your money, the paperback edition is 312 pages long, on US Trade pages (6″x9″). It’s about 84,000 words in total, which is rather longer than The War of the Worlds (60,000) or about 10% shorter than The Hobbit (95,000). See also the blog-posts that about two thirds of the book is based on. You may also be interested in Allyn Gibson’s detailed comments on specific parts of the book (with my responses to some of them, and a bit of back-and-forth discussion). The last page of the book invites us to discuss it here, so here I am! I’m going to start with the highly important point that I enjoyed the book sufficiently to not only recommend it to a colleague at work but to stand over him while he faithfully downloaded it to Kindle. What I like the best about it I can sum up in one sentence: I, too, have never shared this view of Classic Who being some kind of golden age, and have also infinitely preferred the work of Matt Smith and Chris Eccleston over that of David Tennant in the modern period. This, of course, makes your book an incredibly comfortable place to spend some time. There’s more than enough there, however, to disagree with. I’ll try not to be dull though and present anything as mundane as a list, but I would like to make an observation now though for your consideration (please feel free to either reach for a strong drink or head off behind the sofa at any time). On the relative merits of Old and New Who, I recently wrote a guest-post on the blog of Andrew Hickey, who is very much an Old Who advocate, trying to make the case for the new series. I can’t say it was well received in the comments, but no matter: we do what we can. The idea of a Twelve/River romance somehow hadn’t occurred to me before you mentioned it — though in retrospect of course it seems obvious. I do consider it a threat rather than a promise, though, for the simple reason that Alex Kingston’s portrayal of River consistently irritates me. Were she to become a regular companion, I’d consider that a step down from Clara (and far, far down from Amy and Rory.) Still, we should be safe from this given that River has now died twice.